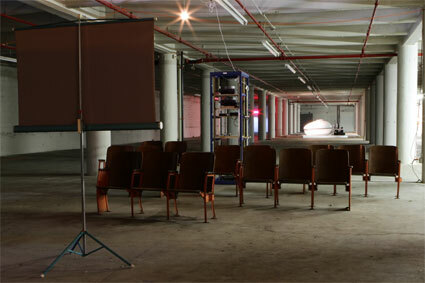 Founded by curator Michael Connor in 2009, Marian Spore was a limited-duration art space that closed on December 18, 2010. Rather than organizing group or solo shows per se, the gallery was a perpetual work in progress; Connor added pieces irregularly, leaving them on display so that repeat visitors would find an accumulation of works. Connor has put the acquisitions into storage and will continue looking for buyers, considering the works on loan until they find a permanent home. Situated in a 16,000 ft loft on the fourth floor of a building in the gargantuan Sunset Park industrial complex Industry City and named after an artist who believed she was in communication with spirits of dead artists (and who was the third wife of Industry City’s founder), I visited Marian Spore for the first time only a week before the closing. Connor looked surprised when I referred to the “current exhibition” of all thirteen works he had gathered over the past months; after all, as the collection grew, each object had been on view continuously. 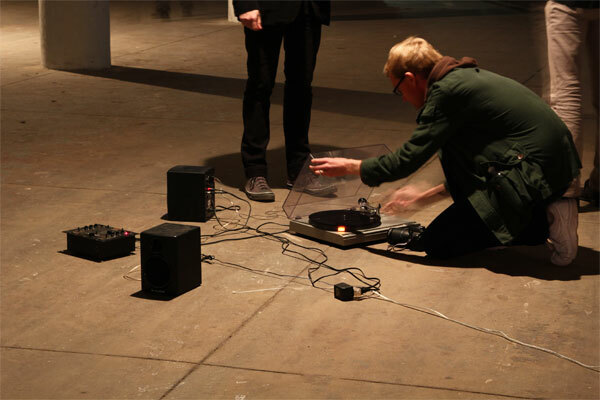 Next to the Kubli piece was Andy Graydon’s Untitled (fault) (2009), comprising a turntable, stereo system, and an acetate record of Graydon’s ambient recordings made at the Metropolitan Museum of Art, in a gallery showing an exhibition of 19th century photography. One side of the disc, cut as a series of locked grooves, was chewed up by the time of my visit (acetates are test pressings which are meant to only be played once or twice and deteriorate rapidly, this one having been spun numerous times over the past year), but the other side, 12 minutes of footsteps and barely intelligible conversations, was still playable. Adjacent to Graydon’s setup was Graham Parker’s Kid Weil (2009), which also referenced the 19th century in its neon signage of the word “cacklebladder,” a pig’s bladder filled with chicken blood used as a device by grifters of the time (they would keep it in their mouth for use in faking a deadly fight if a given scam needed to be aborted). The word was appropriated from a spam email sent to Parker; a puddle underneath, refreshed daily, provided a dim reflection of the sign. (Besides the inevitable puddles at the base of the FLOAT! tank, in Christopher Robbins’ offsite piece, WPA (2010), a nearby “puddle-prone patch of damaged sidewalk” by the local subway station was repaired by a team hired by Robbins in the spirit of the Depression-era Works Project Administration.) Marina Zurkow’s Paradoxical Sleep (Industry City) (2010) took the aquatic theme to an extreme as a five channel video showed the gallery itself, the building, and the street outside all submerged after an imaginary flood—which could be read as a humorous, après moi, le deluge comment on the gallery’s pre-ordained lifespan in the space. Light was the other recurrent thread running through Connor’s selections. The Plug’s The Best Little Secrets Are Kept (Hooligan) (2010) stationed a bright white bulb inside a tall metal locker drilled full of holes that formed a large “x.” In Joe Winter’s series Models for a History of Light (2010) construction paper is slowly discolored in real time by household lamps (a process reminiscent of Graydon’s ever-decaying acetate), and displayed on a wall and in portfolios, resulting in gentle-hued abstractions with an occasional orb suggesting a setting sun. 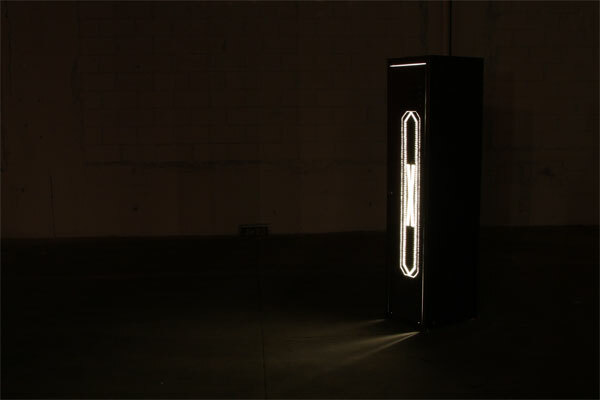 A projected light piece as well as a conceptual sound piece, Anna Lundh’s Conveyor Loop/Lopande Bandet (2009) took Swedish composer Karl-Birger Blomdahl’s notes for sounds for an unrealized 1966 opera project that imagined humankind’s computer-led future as its source. The lists of sounds (“a train passing,” “a car horn,” ”CRASH,” “oatmeal boiling,” “closing an old heavy book” etc.) 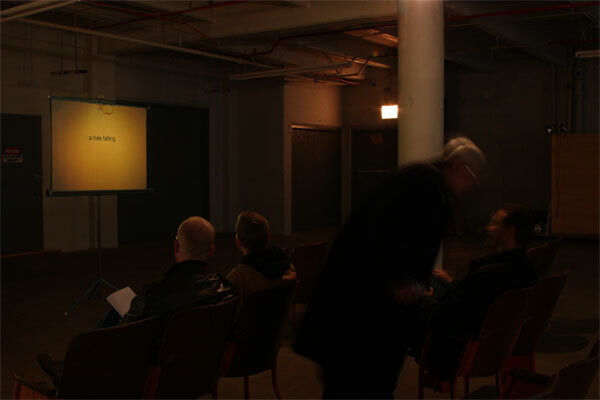 were projected one by one on a screen by two alternating slide projectors, timed according to Lundh’s own live performance of the piece at the gallery in November 2009. Stationed parallel to the Winter series at the opposite end of the loft, the two pieces seemed to echo each other, as Lundh’s/Blomdahl’s descriptive words were printed on slightly discolored white paper tacked to a wall. It may be useful to note the chronological order in which these works were acquired: Graydon first (a nice conceptual gesture—launching a gallery with a recording of another gallery! 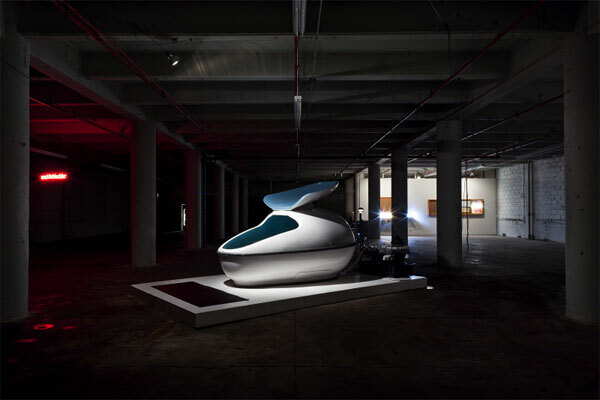 ); then Lundh, Parker, Joyce Kim’s Traces Blue VII (2009, a sculptural installation), Winter, Kubli, Robbins, The Plug, and Zurkow (last October). Billed as “an art space that is formatted like a permanent collection,” Marian Spore was also like a game of Scrabble with the limitation of a lease rather than letters, its proprietor letting the works fall into place intuitively. If you ask me, someone should buy the entire collection as a piece in and of itself; as a curatorial work, the whole is even greater than the sum of its parts. Over the past two decades, guitarist Alan Licht has worked with a veritable who’s who of the experimental world, from free jazz legends (Rashied Ali, Peter Brotzmann) and electronica wizards (Fennesz, Jim O’Rourke) to turntable masters (DJ Olive, Christian Marclay) and veteran Downtown New York composers (Phill Niblock, Rhys Chatham). With Sonic Youth’s Lee Ranaldo, he founded Text of Light, an ongoing ensemble which performs freely improvised concerts alongside screenings of classic avant garde cinema. Licht has written extensively about the arts for the WIRE, Artforum, Modern Painters, Art Review, Film Coment, Sight & Sound, Village Voice, Time Out New York, and other publications. His book Sound Art: Beyond Music, Between Media, the first extensive survey of the genre in English, was published by Rizzoli in 2007.